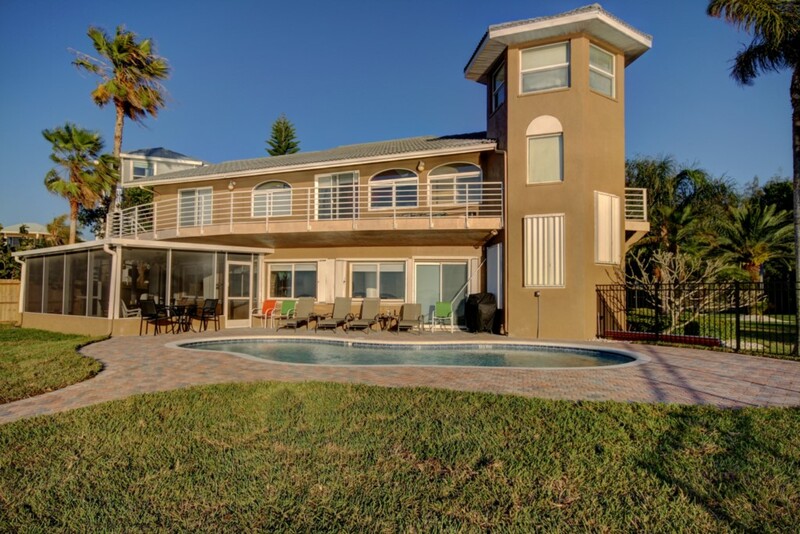 Our Luxury Florida Villa is a 4500 sq feet spacious and distinctive five bedroom, four bath home located in Crystal Beach. 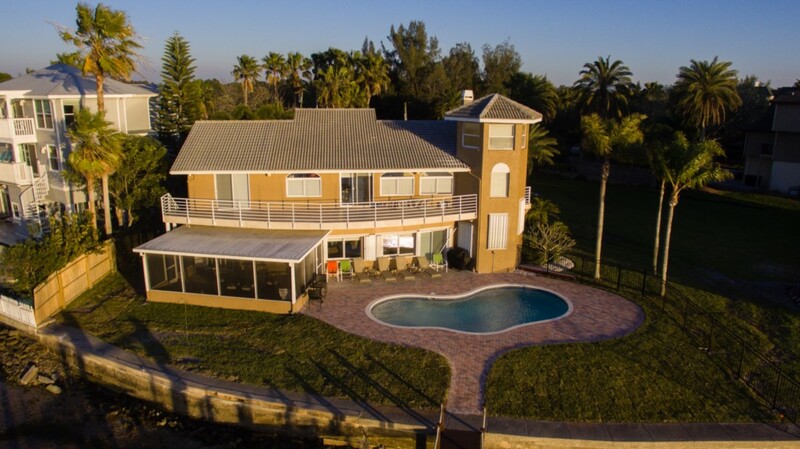 Our professionally decorated home has a large open floor plan that provides sweeping views and the ultimate in comfort and luxury.This beautiful home features a brand new pool facing the water. 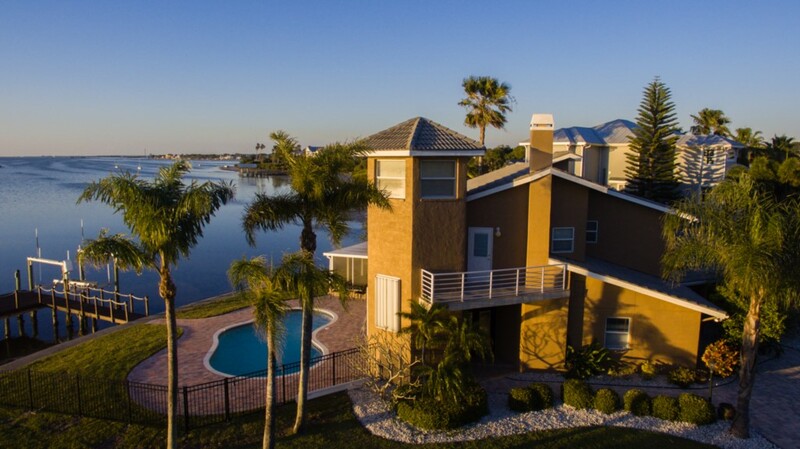 Your family and friends will delight in the open space with water views, high ceilings and spacious rooms and brand new pool. 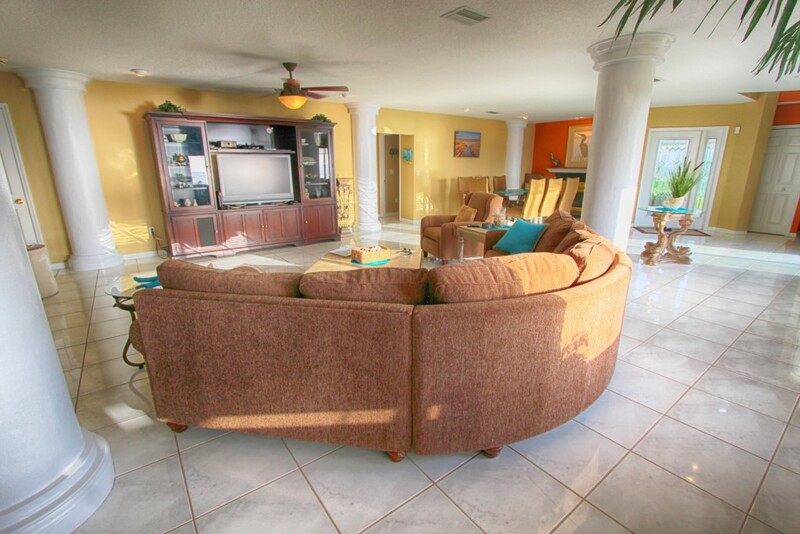 Upscale furnishings will spoil and pamper you as you enjoy your much deserved vacation. Our property features two floors with a total of 5 bedrooms and 4 bathroom to comfortably accommodate up to 12 guests. 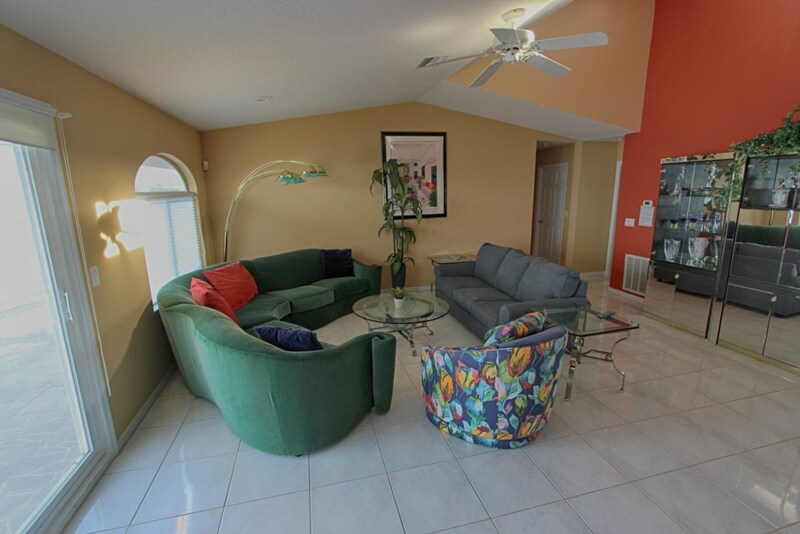 The first floor consists of a large living and dining area, fully equipped kitchen, two bedrooms and two bathrooms. 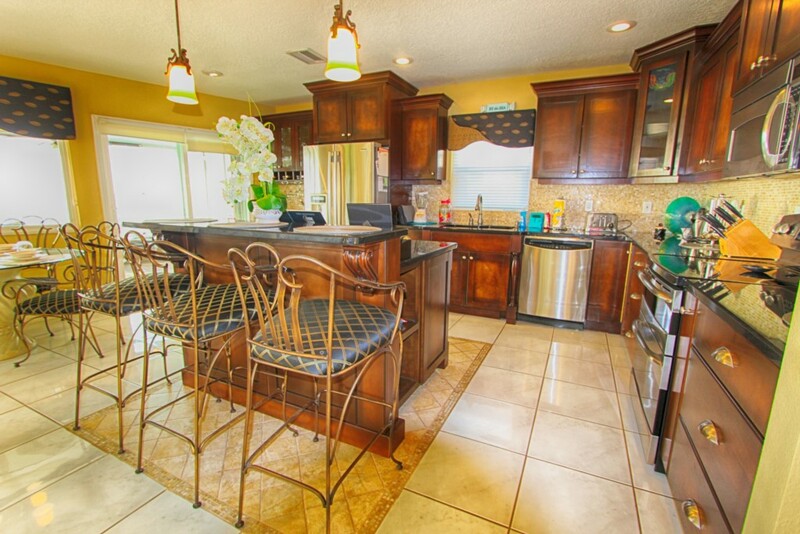 Your fully equipped kitchen, with eat-in bar, flows into the sunny living area and then on to your open dining area. This large public area allows socializing and togetherness for the entire group. The dining table accommodates 8, with 4 more seats at the breakfast area and 2 more in the breakfast bar, making dining together a refreshing reality. 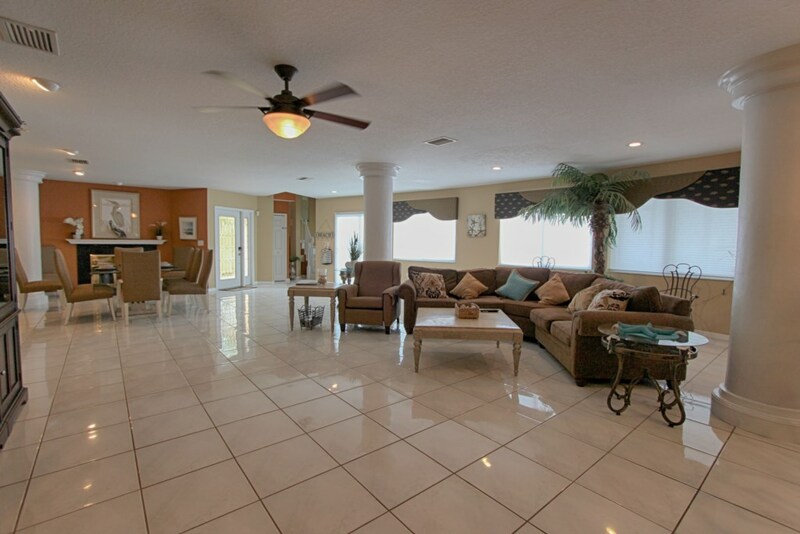 The living room is perfect for entertaining friends and family. The open design includes an adjoining dining area. 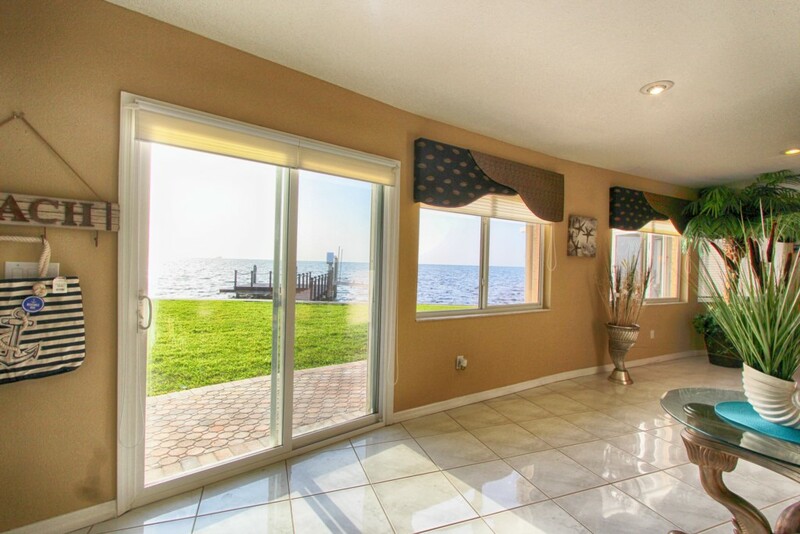 The large windows allow for beautiful water views and colorful sunsets. 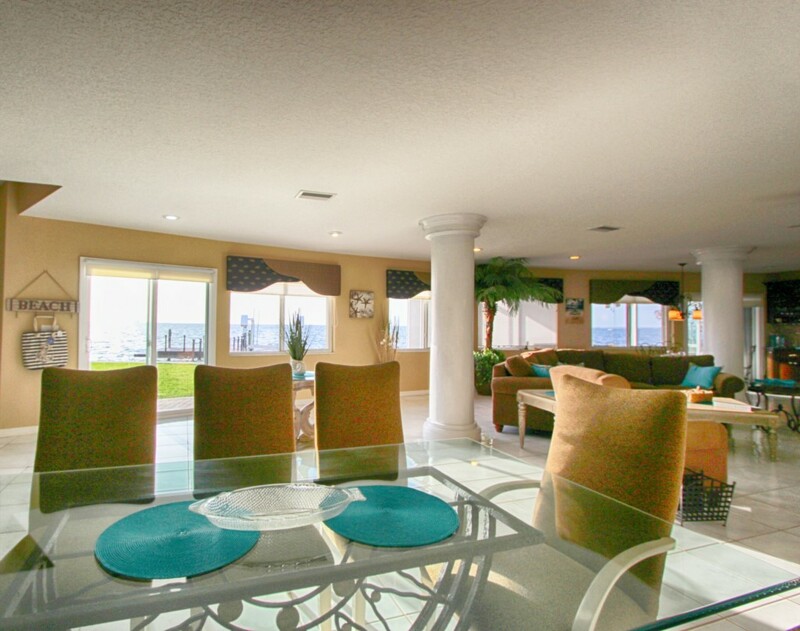 The home’s open living/dining room area overlooks the water. 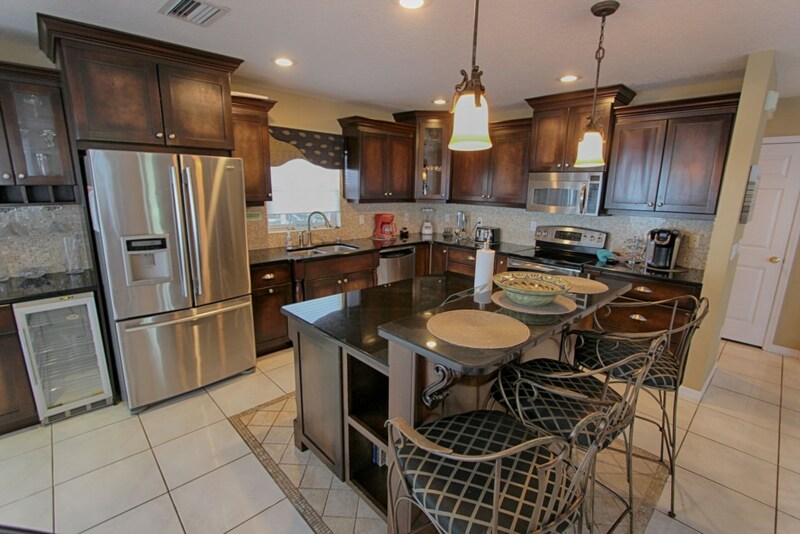 The kitchen features granite counter tops, stainless appliances and much more - all to make your vacation experience enjoyable, carefree, and fun! 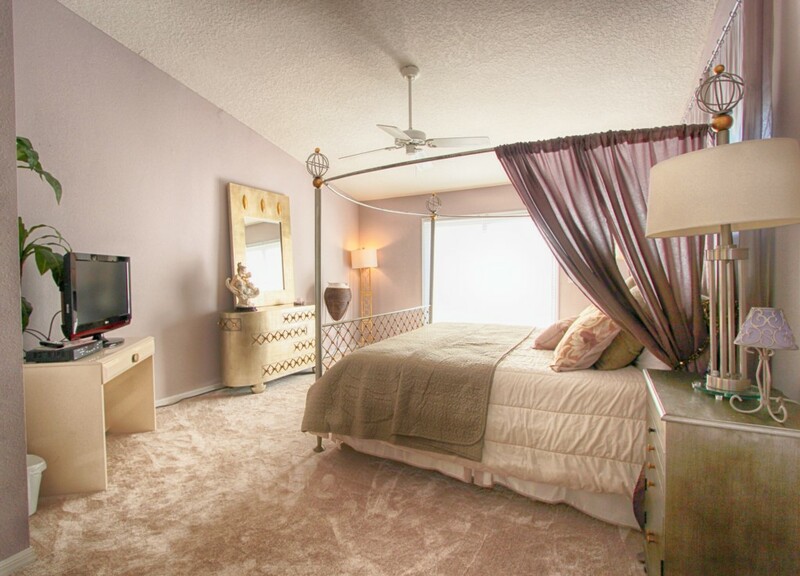 The first bedroom with a Queen-size bed is located right off of the dining area. 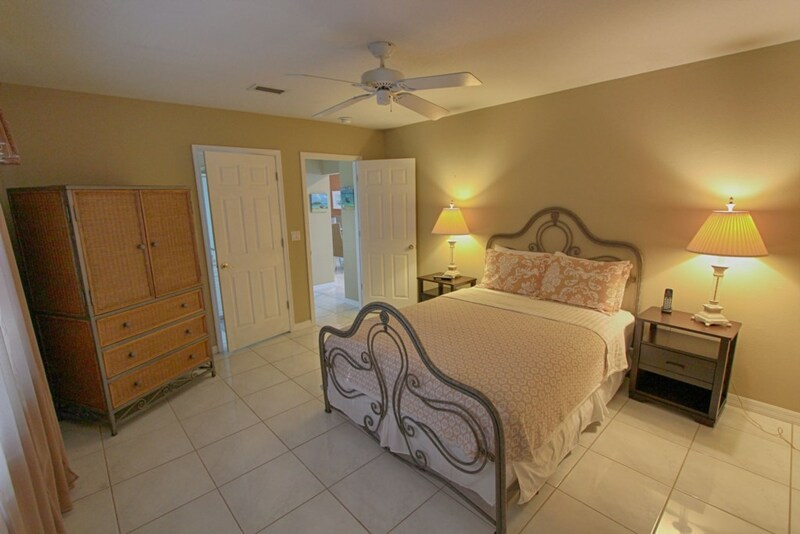 The second bedroom also has a Queen-size bed and a private bathroom. 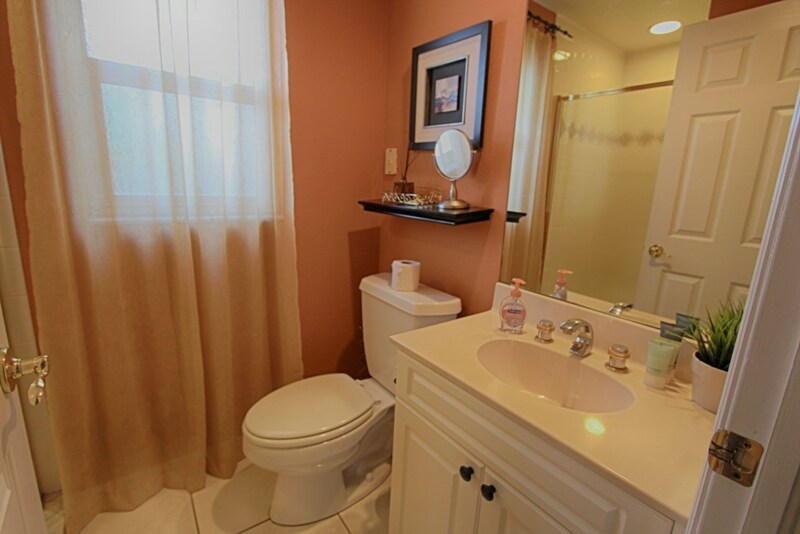 There is a second bathroom by the laundry room area on the first floor. 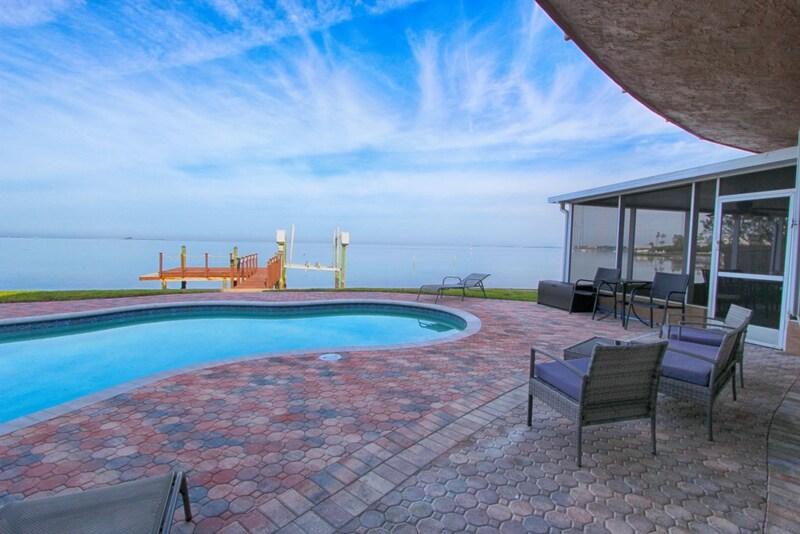 The pool area also features a covered porch with great views of the water. The second floor has a second living area with fresh-bright color furnishings, mini bar and access to a large balcony facing the water. 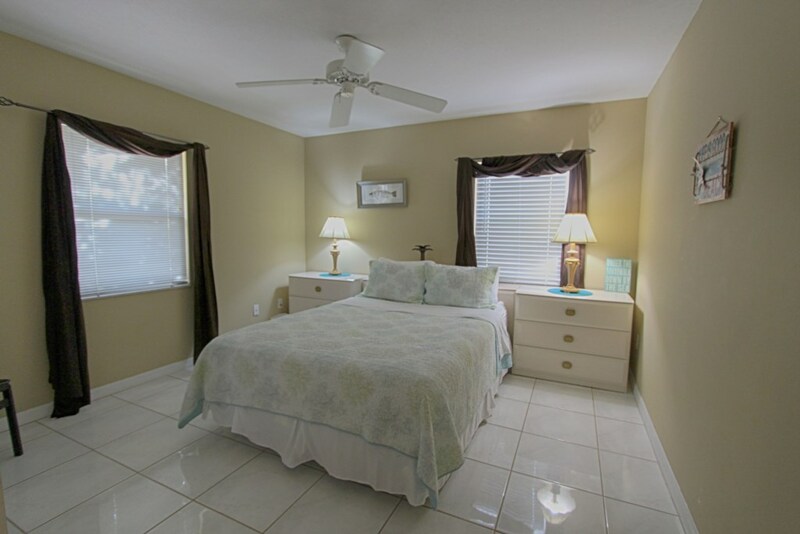 This second floor also features three bedrooms and two bathrooms. 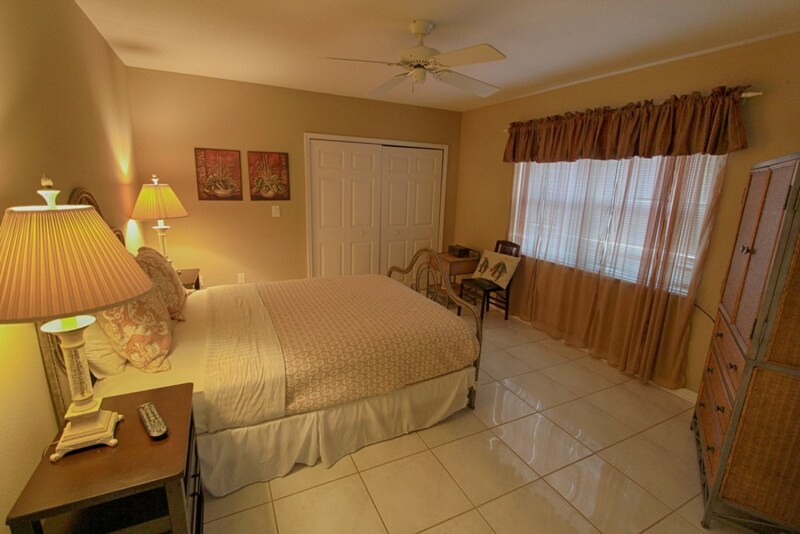 Third bedroom has a Queen size bed and it shares a bathroom with the fourth bedroom which also has a Queen size bed. 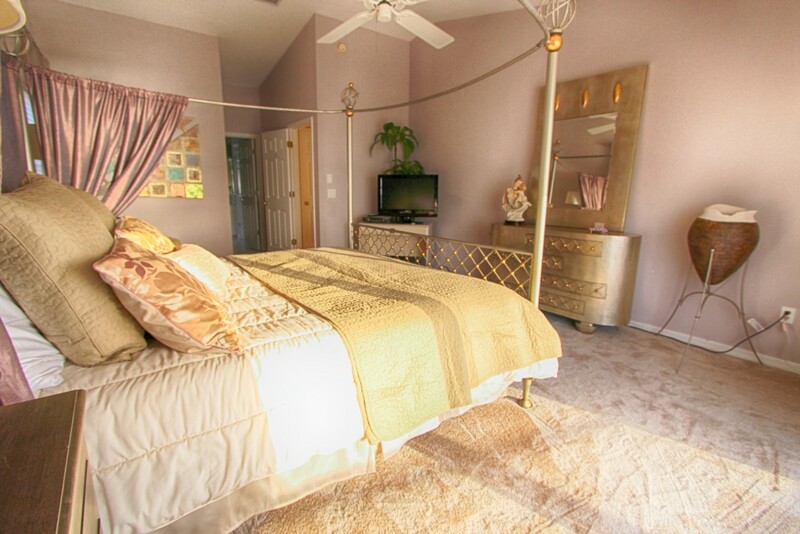 The master bedroom has a King size bed and a private bathroom. 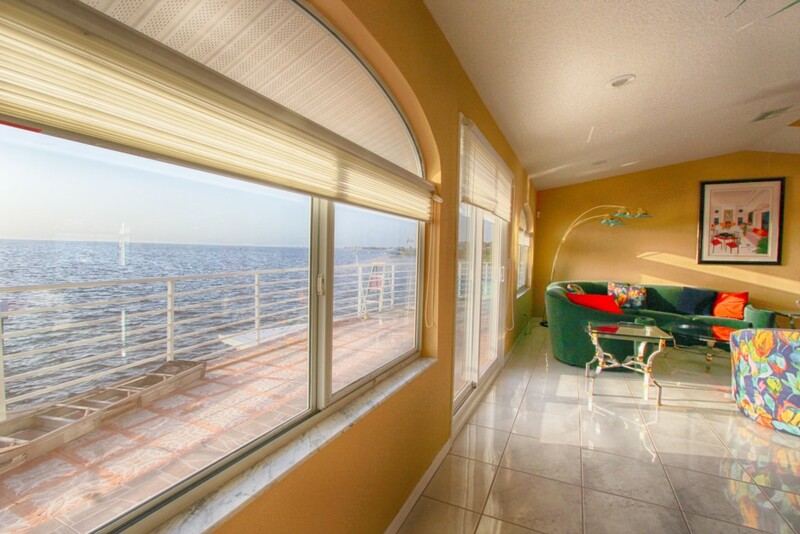 Master bedroom has access to the large balcony facing the water. 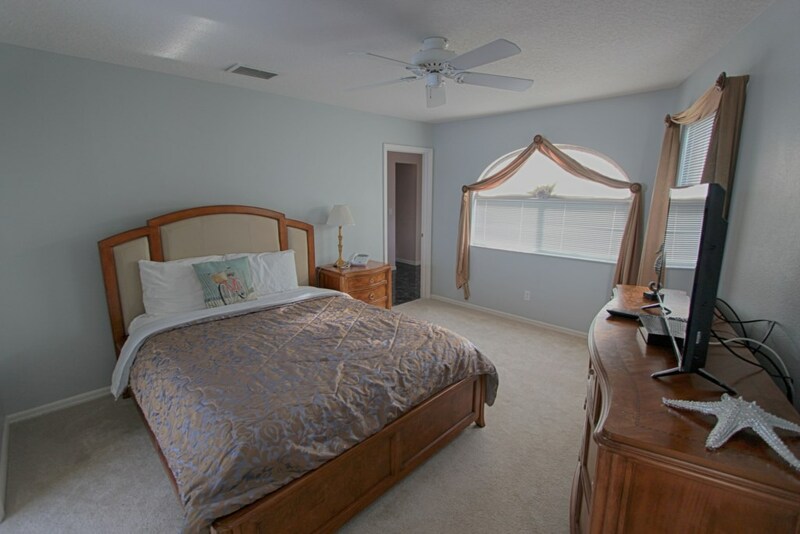 You can also enjoy the water views from the master bedroom, third bedroom and the second living room located on this floor. 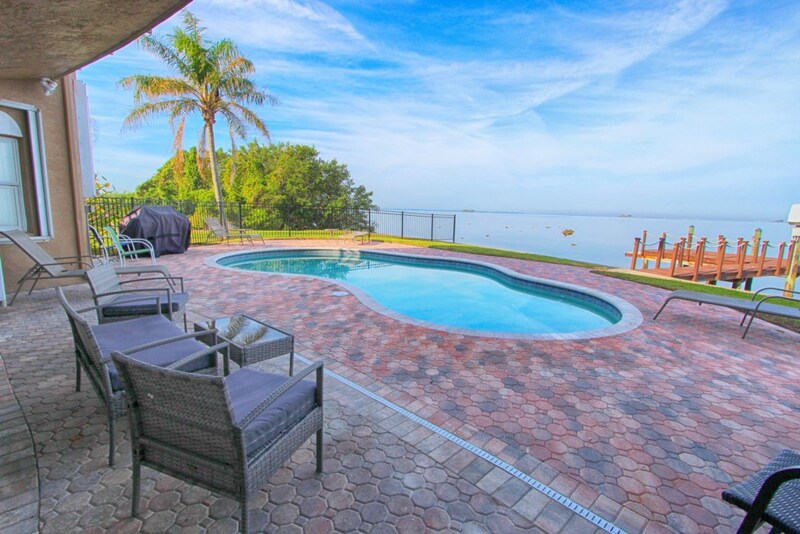 Start your day with breakfast watching dolphins swim the coastline and ending with the most incredible Sunsets in this magnificent waterfront home. 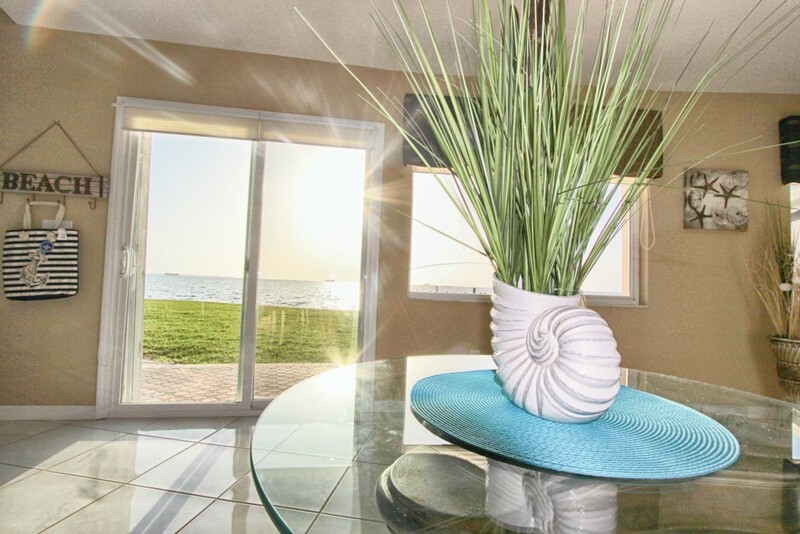 Spacious porches overlooking the Gulf of Mexico are perfect for viewing egrets, pelicans and other coastal wildlife. Directly off shore is a rare fresh water spring and cavern, explored and filmed by National Geographic. 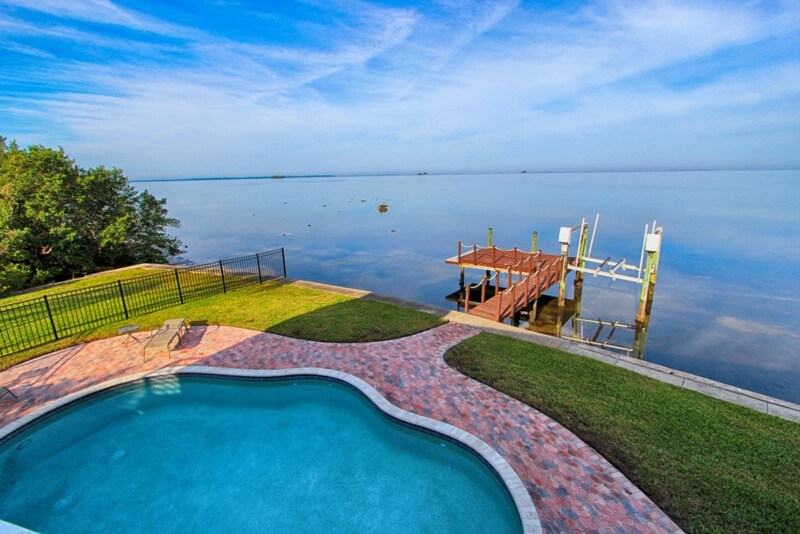 This spectacular rental offers a private swimming pool and expansive water views from different sides of the home. 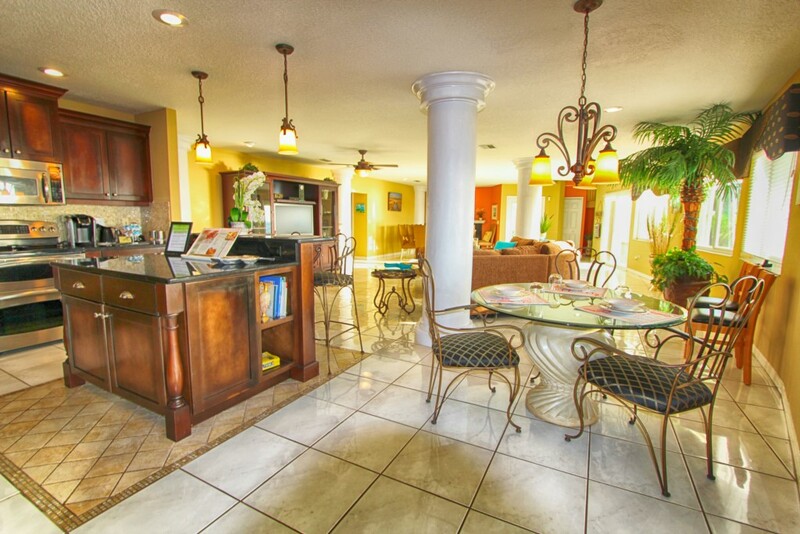 We have thought of every detail you might need for a comfortable and unforgettable vacation. 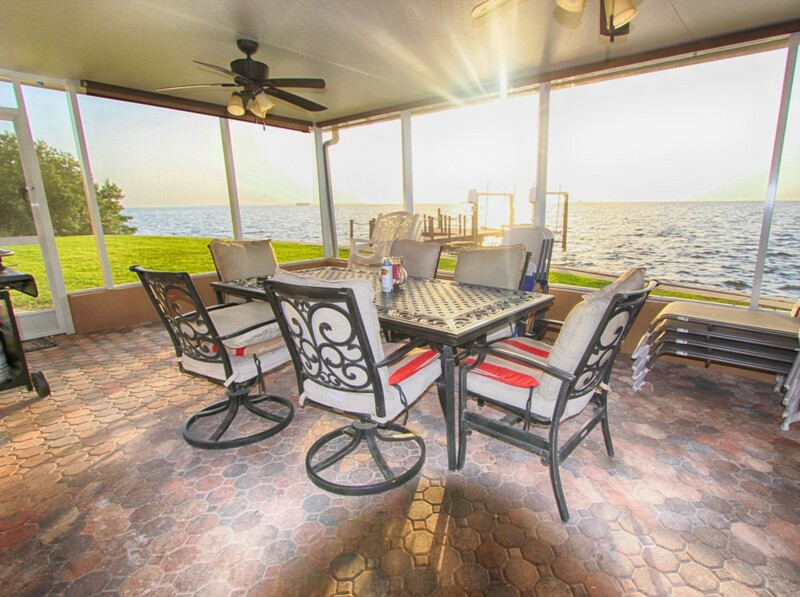 You will love to hang out with family and friends on the large balcony enjoying the calm breeze and soothing sounds of the water. 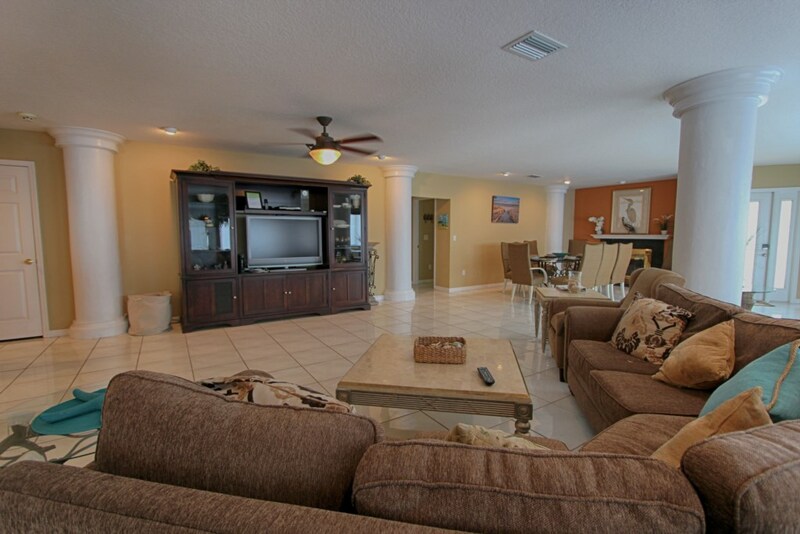 Our Luxury Florida Villa is the perfect escape for family fun and relaxation. 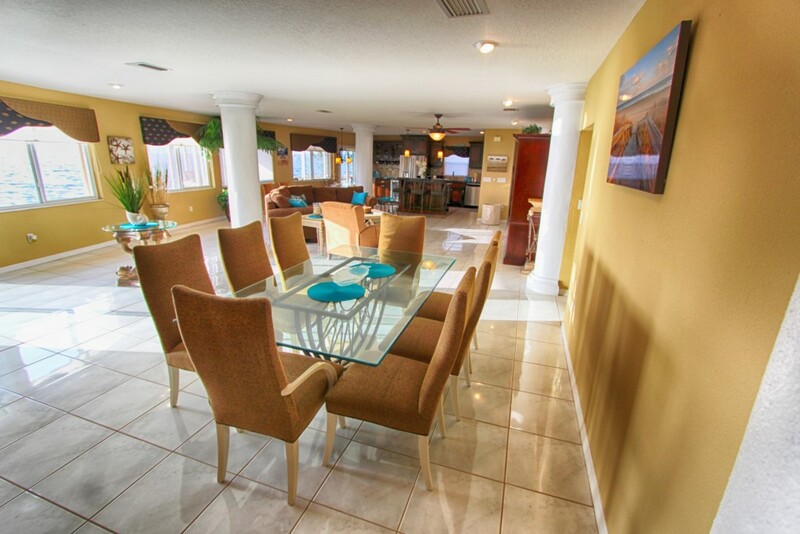 The covered porch and the balcony offer many areas to dine, entertain and relax. One of the most pleasant times to enjoy the breath-taking views is at sunset in our balcony on the second floor. 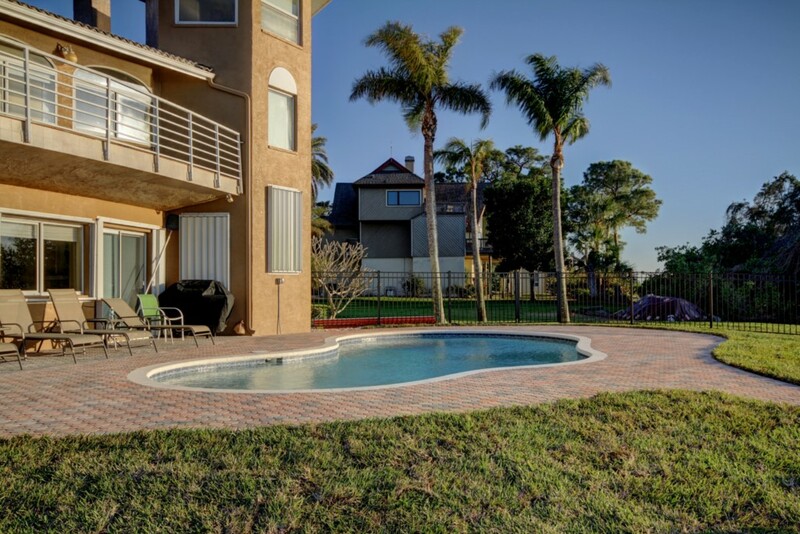 Plenty of outside space is available for grilling, relaxing in the pool or lounging in the comfortable outdoor furniture. 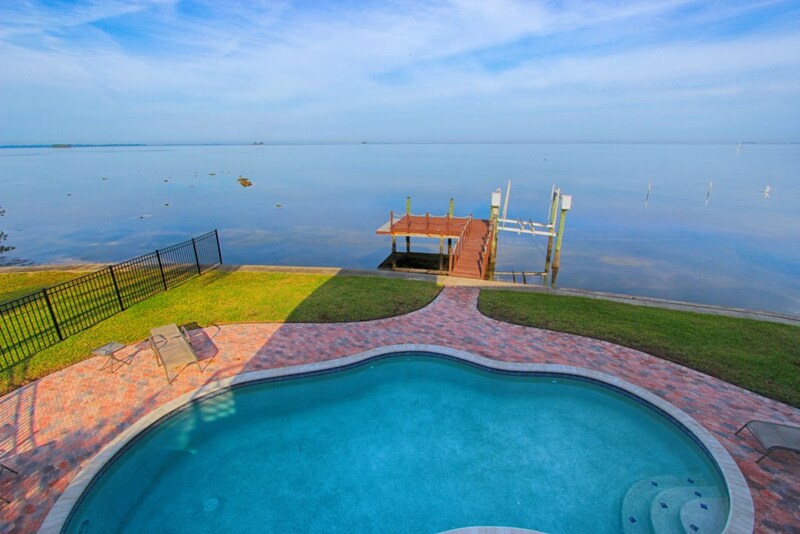 Your own private dock where you can enjoy fishing. We realize time with family and friends is precious. We will make every effort to make your stay at our place an unforgettable time for you and your loved ones. 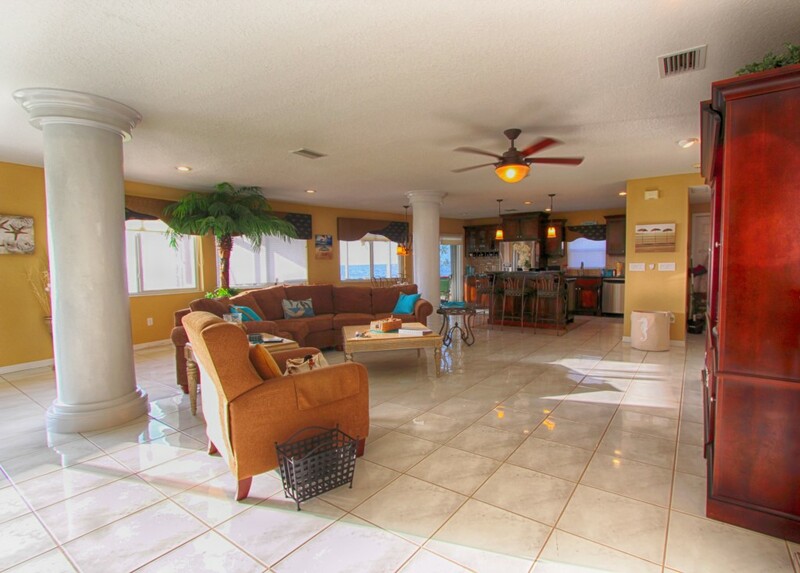 Magnificent Beachfront Home-a Vacation to Remember! Call today to reserve your family’s vacation of a lifetime! 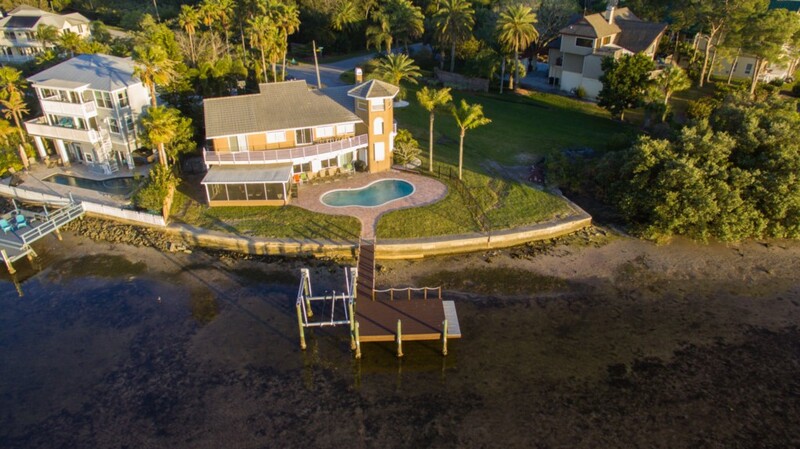 This property is just a 10 minute drive to Downtown Dunedin - which is a must visit! 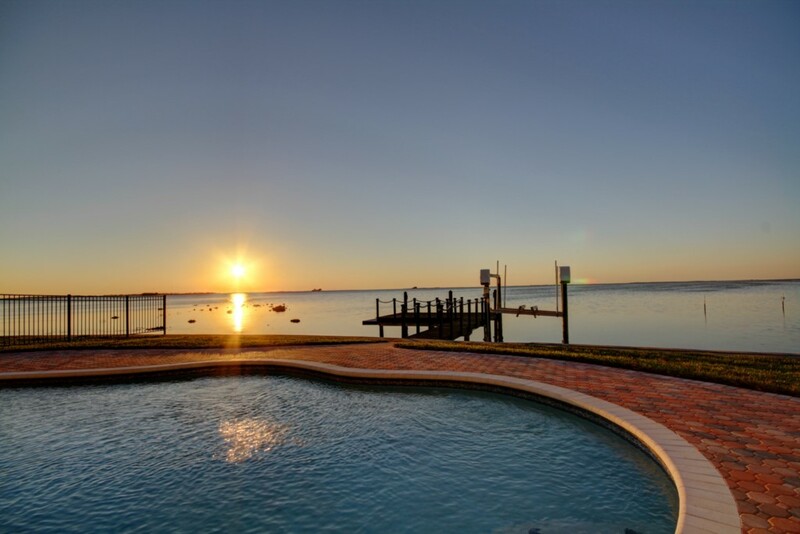 Sunset Beach and Fred Howard State Park are within a 15 minute drive from this property. 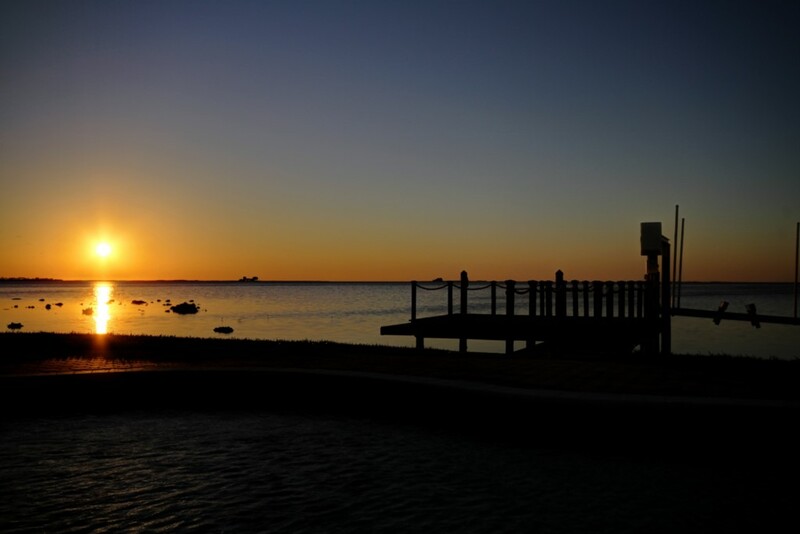 Enjoy the park setting & shell pathways, fish from the pier or visit nearby Honeymoon Island & take a ferry to Caladesi Island, with its beach rated best in America 2008. 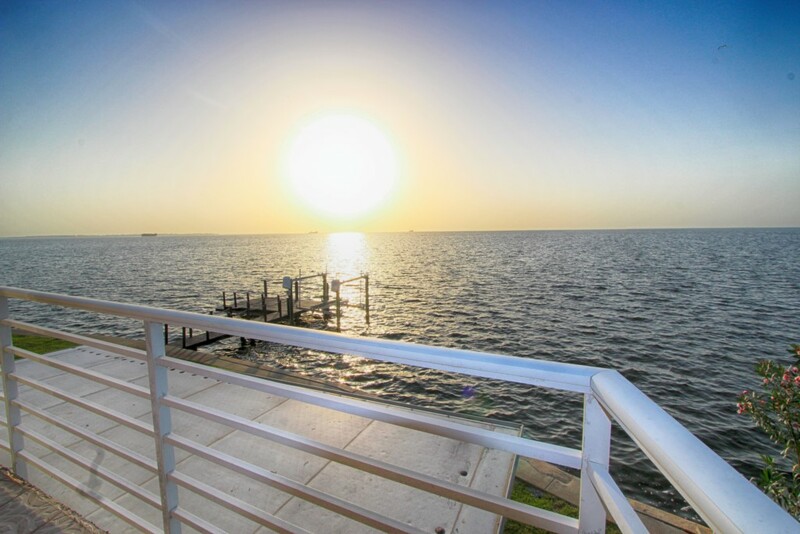 With lots of nearby restaurants in Tarpon Springs, & Palm Harbor, Crystal Beach is the hidden gem of the Gulf Coast. 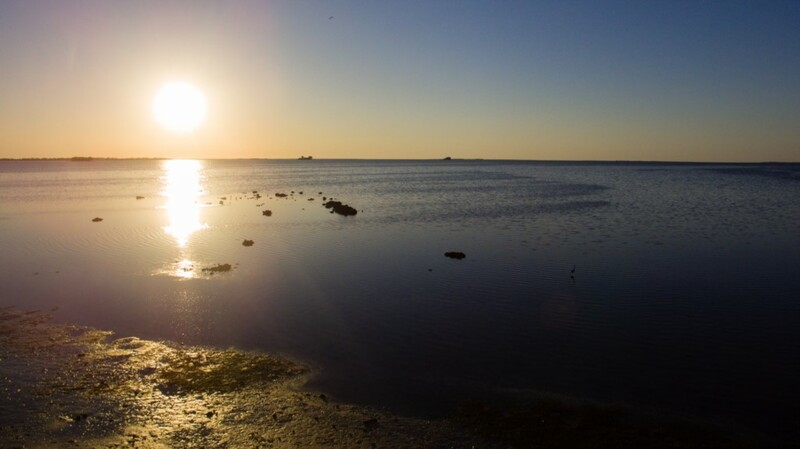 Crystal Beach is a beautiful area, originally a fishing village developed in 1912, this area has remained unspoiled and has been compared to Key West with it's feel and charm of a seaside community. 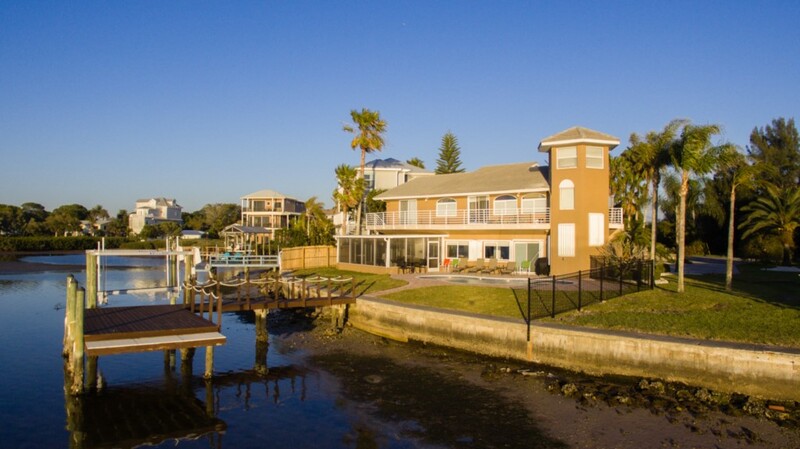 Crystal Beach is approx 13 miles N. of Clearwater Beach, away from all the hustle and condos, yet we are close to all the bigger beachy beaches, and close to Tampa International Airport 35 mins away. 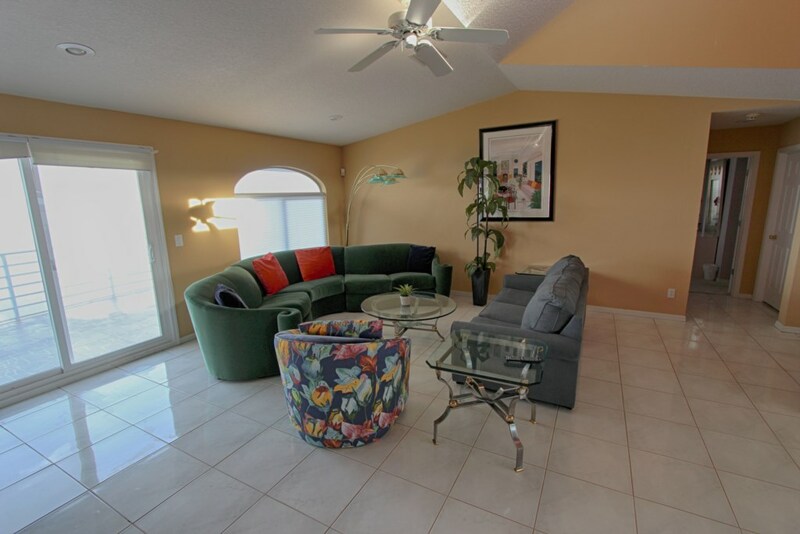 Very close to other beautiful beaches within biking distance, very close to Busch Gardens 30 mins away, Orlando 1 hr and 30 mins away where there are tons of theme parks, Universal, Sea World, Islands of Adventure, and stop by Dinosaur world on the way. Or visit Historic Tarpon Springs Greek Culture 10 mins away, or just kayak right from the vacation home out to local spoil islands to have your own island for the day. 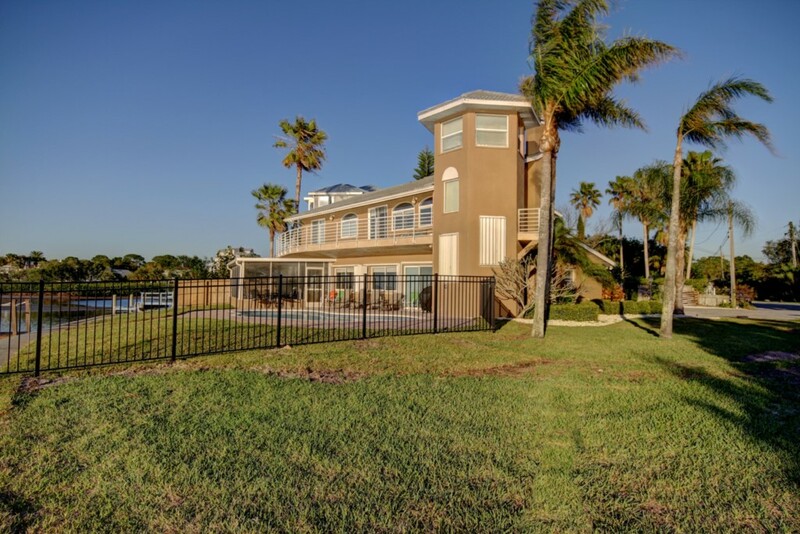 Luxury Florida Villa is located in the town of Palm Harbor on the upper west coast of Florida, which the area offers an expansive park with breathtaking views of the Gulf of Mexico. 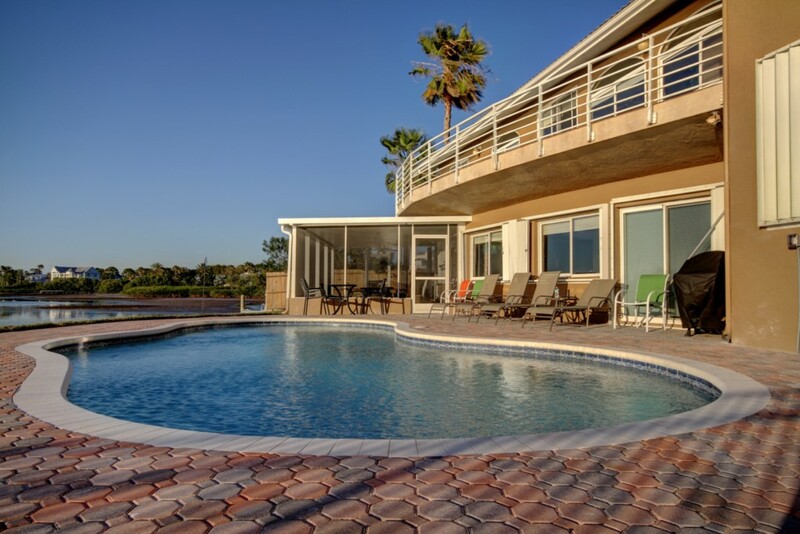 •Tampa International Airport is 40 minutes away. St Pete Clearwater International Airport is 30 minutes away. • Disney, Sea World, Universal and MGM Studios within one hour 50 minutes. • Busch Gardens is 45 minutes away. Clearwater Aquarium home to Winter the Dolphin is less than 20 minutes away. • Famous Pinellas 35 mile bike trail perfect for the walker, runner and cyclist is less than a five minute walk to the trail head. 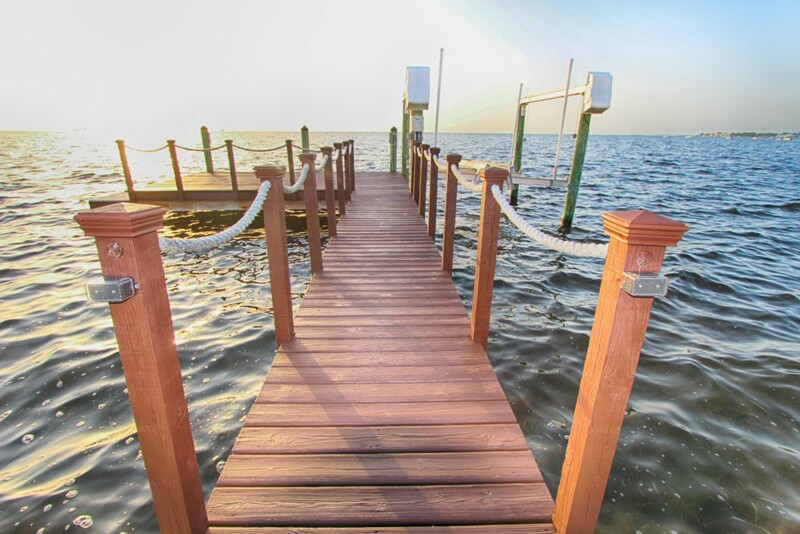 • Public boat launch and several marinas are less than a five minute drive. • If sports are your thing catch a game at Raymond James Stadium home to the Tampa Bay Buccaneers, Tampa Bay Rays, and Tampa Bay Lighting all within a 30 minute drive. Catch a Spring Training game to root on the Toronto Blue Jays or the Philadelphia Phillies less than 10 minutes away. This property and its location are nothing short of spectacular. The home itself perfectly met our extended family needs and there was plenty of space to spread out. We ate at a couple nearby restaurants in the very charming Old Town Palm Harbor area. If you plan on cooking in the beautiful modern kitchen, you may want to bring along your spices, but the home is stocked with more than it’s share of basic appliances, utensils, and dishes. 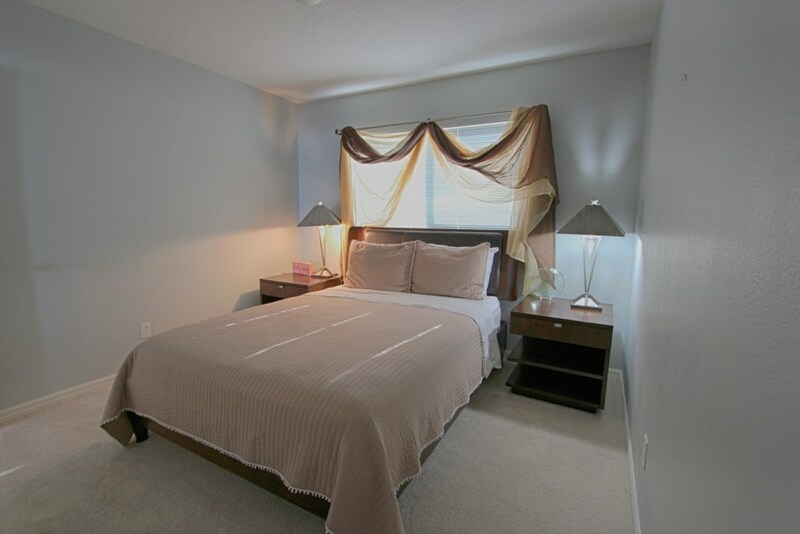 Everything was very clean and it was immediately comfortable living! Out the back door you step into heaven on earth. The pool was beautiful and the ocean view a few steps away provided daily dolphin visits! There is an abundance of native birds, fish, and sea life galore in this area. The kids were catching lizards, starfish, and different types of crabs (and putting them safely back into their respective environment) all week long. We chartered a fishing boat during vacation and found it hilarious when the captain actually brought us to fish near our own dock! We truly had a relaxing, care-free, and comfortable stay and plan to return in the future for sure! Property was as asvertised. Clean, well maintained, and good value for the price. Only minor complaint is that the main downstairs TV is an older sony model that doesnt have HDMI inputs, which limits Using yor own streaming devices. I probably do 10 luxury rentals a year and this one is as good as advertised. The house is as nice as portrayed on the website. Everything works and is in good shape. 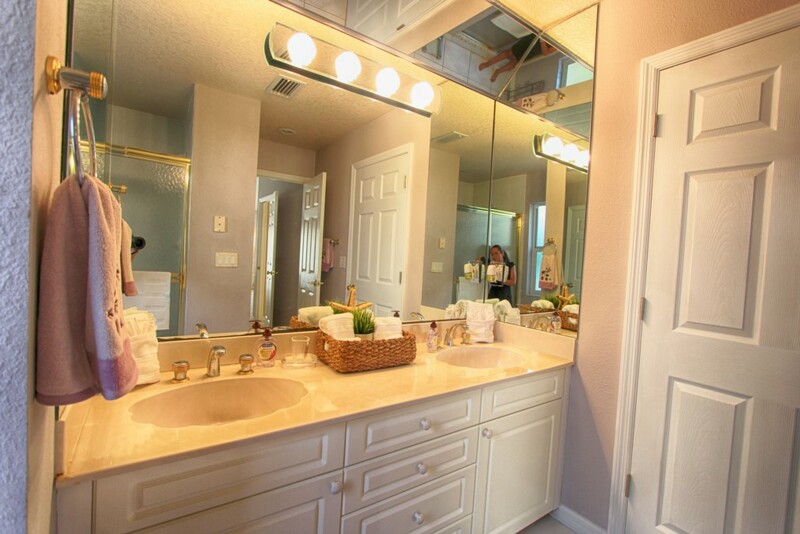 The property is well-maintained and was very clean. Kastly, Mona the property manager that I dealt with from BeachTime was terrific. She's a Top-shelf pro who is very helpful and a sincerely nice person. We had several maintenance issues: lots and lots of burned out lightbulbs and a sticky front doorknob, which were corrected the day I reported them. We paid for the heated pool and it was worth the expense - my nieces had a great time playing in the pool. Only thing that would have made our stay better would have been if we had brought our bicycles and kayaks - a great place to use both! And don't forget your binoculars, especially if you are a birdwatcher. The house was clean and everything was as advertised. Had a great vacation , plently of space,very clean. Our rental manager, Mona was great, very responsive, and helpful. would tell anyone this is the place to rent!! Exceeded all of our expectations! This was the most beautiful vacation for me and my family of 4. 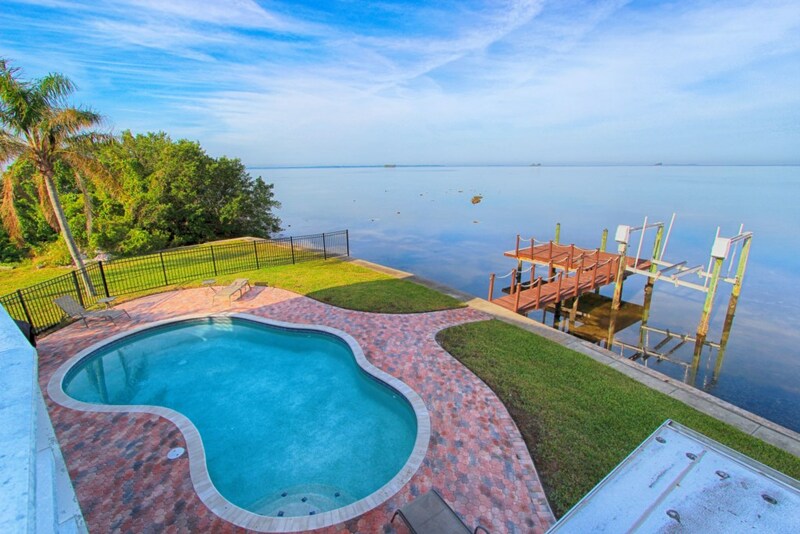 Nice size pool with a breathtaking view of the gulf. Loved that there is a pier and covered lanai too! 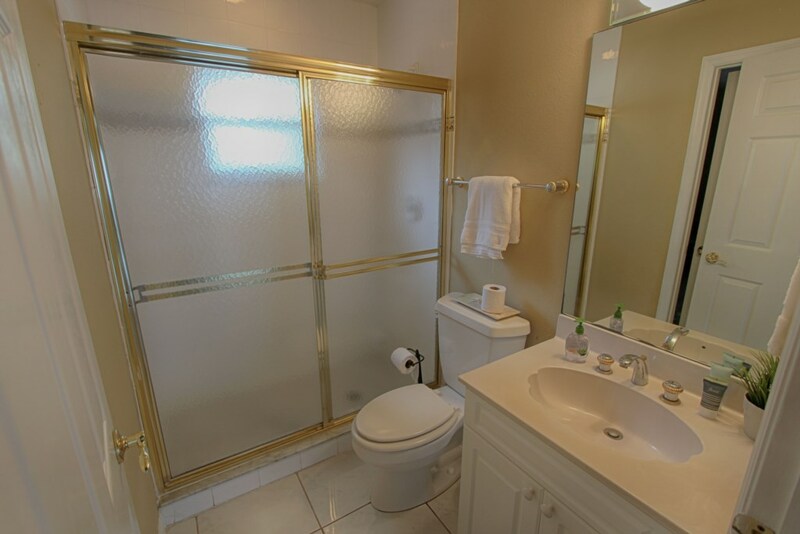 Kitchen is spacious and plenty of bathrooms (with showers and 1 bath). Lots of local restaurants which we prefer and love the quiet serene area it is located in. 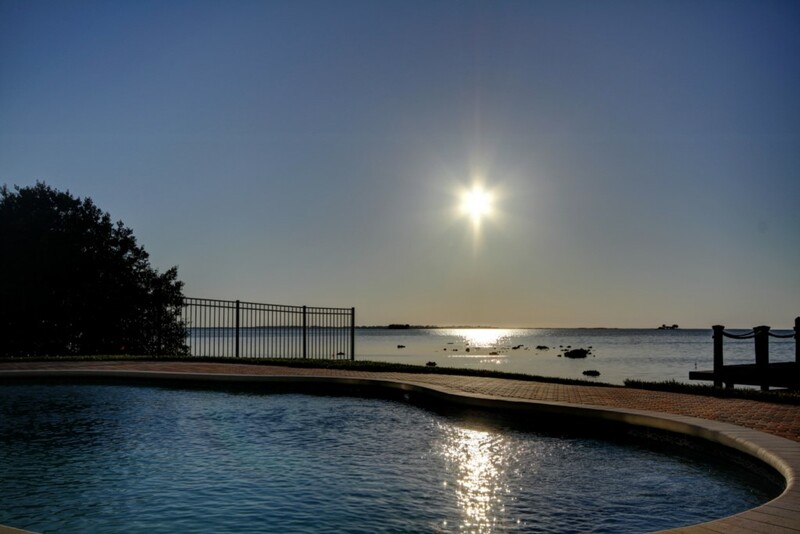 There are two park beaches up the road from the home and Clearwater is just 20mins away!! Can't wait for our next trip again and would recommend this luxury villa to everyone! Thank you for the comfortable and memorable stay here!! This home was amazing!! It was much more than we hoped for. The view was spectacular and even had dolphins swim by. The only down side would be the pool is not heated so it was a little chilly. We will definitely stay here again! !